In 1941 the Chrysler Corporation launched a brand new car, the Dodge Luxury Liner, with superb styling and engineering not previously available in the medium price field. 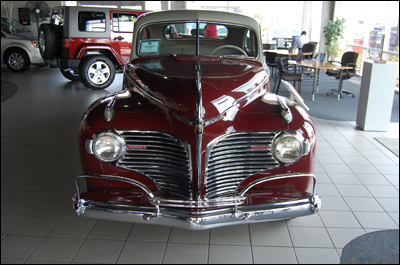 Sparkling with a distinctive type of beauty and advanced engineering features, the 1941 Dodge Luxury Liner was truly a car ahead of its time. For only $25 extra, a proud owner could have fluid drive. Just imagine being able to brake to a stop and stay in gear…yes, and start again in high without shifting! Also featured was floating power, safety rim wheels, overdrive, and a smooth six cylinder engine. This particular Dodge is a remarkable survivor. 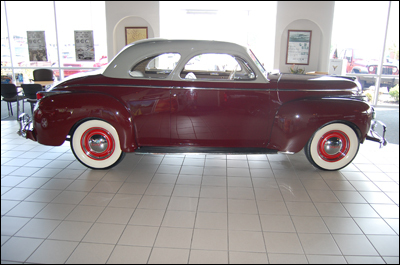 Sold new on June 6, 1941 to Mr. William F. Varga of McCook, Nebraska, the car was carefully maintained, always garaged and seldom driven. Later it was purchased by the owners of the Grand Motorcar and Piano Museum of Durango, Colorado, where it remained on display for many years. Never restored, and still in its original condition, the car was acquired by Swope’s Cars of Yesteryear Museum in July, 2010. Total mileage: 22,557.